Written by Fred Patten, and intended for Apa L, 2127th Distribution, LASFS Meeting No. 3575, February 16, 2006. Last Tuesday (the 7th), I went with both Michael Burlake and Rob Powell to a Disney screening of Bambi 2 (and it is Bambi 2 on-screen, not Bambi II as the press kit and other publicity have it) at the Harmony Gold screening theater on Sunset Boulevard. I got my invitation as an ASIFA member, but the screening seemed to be primarily for the Disney animators who had worked on it (those at the Disney studio in Burbank, anyway; most of the actual animation was done at the DisneyToon studio in Australia just before Disney closed it) and their families. The audience included the movie's director, producers, writers, editors, and other key personnel. Unfortunately, their families included as many screaming children as a regular Saturday matinee audience. This was unfortunate because Bambi 2 really is excellent. I was enchanted; it is much better than I had expected - much more enjoyable than Chicken Little, certainly. It should have had a theatrical release rather than going directly to DVD. If it is not quite as good as the original Bambi, it comes very close. It is more of a children's film than Bambi, since it is set during a narrower time span than the first film; just the few months right after Bambi's mother's death, while he and Thumper and Flower are still young children. The main plot revolves around Bambi gradually bonding with his father, the very reserved Great Prince of the Forest (and if real male deer do not acknowledge their children at all, the original Bambi with the friendly owl and all the young animals as playmates was just as unrealistic). The voice actors (Patrick Stewart is the Prince of the Forest) all do a fine job of making the characters emotionally convincing. I do not know how much of the animation is traditional 2-D and how much is computer graphics, but visually Bambi 2 is a close match to the famously "beautiful" cel animation of the original. The new songs are in the same tradition, also. I suspect that watching the two features together would reveal some inconsistencies (about half of Bambi takes place the year after Bambi's mother's death, when the animal children are all adolescents; and they do not show any of the growth that happens to them as children during Bambi 2, or the new characters such as Thumper's four little sisters), but that is a comparatively minor nitpick. I am glad that I had the opportunity to see Bambi 2, especially on a full-size movie screen; despite all the screaming little children. Michael Burlake drove me to Thursday's LASFS meeting. The program was John DeChancie reading "The Loaves and the Fishes", his most recent short story. He already published it here in Apa L shortly after it appeared in Mike Resnick's anthology I, Alien last year, but it was nice to hear it aloud, too (and of course much of the LASFS does not get Apa L today). On Saturday Rob Powell took me to the February Cinema Anime meeting. It was an average meeting, disappointingly without any new attendees from Animé Los Angeles. The program was mostly one or two new episodes of the half-hour Japanese TV anime programs we regularly show: Galaxy Angel Z, Fruits Basket, Heat Guy J, Slayers Next, Planetes, Azumanga Daioh!, Samurai Champloo, Bleach, Ghost in the Shell: Stand Alone Complex - 2nd Gig, Goddannar, and Maze: The Mega-Burst Space. We did see the first episode of one new series, Genshikan, a comedy about a high-school anime/manga fan club. "It's us! ", somebody in the audience kept chanting as the geeky high-schoolers kept trying to get as much adult pornographic anime as they could. After the meeting, Powell took me to the Barnes & Noble bookstore in the Burbank Media Center where we both bought copies of my Furry! anthology, which was published on February 9th. (I am supposed to get at least one author's copy from iBooks eventually, but I wanted to see it right away.) We had to ask where it was, because it turns out that iBooks has packaged it as a prestige General Fiction/Literature trade paperback rather than as a s-f mass-market paperback. I have very mixed feelings about this. The prestige is nice, but the book's natural market is the s-f readers who browse the sf/fantasy category shelves. I do not know how many fans who might otherwise buy it will find it in the Literature section of bookstores. I also cringed as an ex-librarian at seing that it has two titles; Furry! : The World's Best Anthropomorphic Fiction on the front cover, and Furry (no exclamation point): The Best Anthropomorphic Fiction Ever on the title page. This will give cataloguers a headache at any libraries that add it to their collections. But it is attractively packaged (and with a totally different cover than that shown in the premature announcement for its release in July 2005), and it is theoretically in bookstores across North America (even if it is "hidden"), so it should reach a much larger readership than the 2003 Best in Show edition which is unknown outside of Furry fandom. That is very good. I think that I mentioned here about six months ago that Tucson Furry fan Mark Ashworth had volunteered to write an entry for Wikipedia about me if I would send him the necessary information. I did, and I more or less forgot about it. In the interim, someone unidentified wrote a separate, very brief entry on me as a Furry fan only, for WikiFur. "The moderators tend to pounce on inappropriate material fairly quickly, so I would guess your article is safe unless someone especially gets a feather up their rear (it happens). There is so much new material being added to the Wikipedia that attention is usually shifted towards it, and objections are raised quickly. In other words, just make a copy for your own records and check back every month or so. If it is gone, it can be placed on the furry wiki I mentioned earlier. The longer it stays unchallenged, the more likely it will remain unscathed. Glad to do this for you. Somehow, after the decades you spent in this, it just seemed right that you should get your own article -- not as prestigious as Encyclopedia Britannica or World Book, but your own nonetheless." Frederick Walter Patten was born in Los Angeles, California on December 11, 1940 (Father: Beverly Walter Patten; Mother: Shirley Marie Patten (Jones)). He has two younger sisters, Loel Anne Patten (born 1943) and Sherrill Clare Patten (born 1947). He is especially known in Anime/Manga and Furry fandoms, where he has gained distinction as a historian to both. His parents taught him to read early with the L.A. Times and Examiner comic strips, and got him a subscription to WALT DISNEY'S COMICS & STORIES around 1945. Encouraged to read anything at his house, his reading during his elementary school years included LIFE, COLLIER'S, the SATURDAY EVENING POST and books his parents brought home from the library. He also read the superhero comic books from about 1949 until they were discontinued in the early 1950s. Fred estimates he started reading science fiction at age 9 because he recalls reading SIXTH COLUMN by Robert Heinlein when it was new (published in 1950). From then on he read all the science fiction and fantasy available to him. When he entered junior high in 1952, the first sci-fi paperbacks by Ace Books, Ballantine & other publishers began to appear so he began to buy & collect them and the main magazines like ASTOUNDING, F&SF and GALAXY throughout the 1950s. During this time he learned about sci-fi fandom from mentions of it in the magazines, and attended the World Science Fiction Convention when it came to L.A. in 1958. He entered the University of California at Los Angeles in 1958, and its graduate School of Library Science in 1962. He became active in fandom after discovering the Los Angeles Science Fantasy Society in 1960 while he was a sophomore. By the time he graduated with a Master's degree in Library Service in 1963, he had been writing for sci-fi fanzines and publishing his own for three years. His Master's thesis was on the books of Andre Norton. He held a variety of professional library jobs from 1963 to 1990, notably that of technical catalogue librarian at Hughes Aircraft Company's Company Technical Document Center (CTDC), El Segundo, Calif., 1969-1990. From 1991 to 2002 he was employed at Streamline Pictures, one of America's pioneering anime specialty production companies. He became an active sci-fi and comics fan during the 1960s. From 1972 through 1975 while he was a catalogue librarian at Hughes Aircraft Company, he became a partner with Richard Kyle in Graphic Story Bookshop in Long Beach, California, the first comic-book specialty store to import comic books from Europe and Japan. This led to his becoming a pioneering anime fan, co-founding the first anime fan club, the Cartoon/Fantasy Organization, in 1977. He began writing free-lance articles about anime for popular culture magazines in 1980. He lost his job at Hughes Aircraft Company after 20 years during the collapse of the aerospace industry in the late 1980s. He had been giving free consulting to Streamline Pictures, a pioneering professional anime company, since it started in late 1988, so its founders Carl Macek and Jerry Beck persuaded him to turn his hobby into his profession and become their first employee. He continued writing freelance articles on anime while working there. After Streamline Pictures shut down in 2002, he became a full-time freelance writer specializing in anime and manga. He was writing monthly columns plus lots of individual articles for ANIMATION WORLD MAGAZINE, NEWTYPE U.S.A., the COMICS BUYER'S GUIDE, and other magazines up to March 2005, when he had a stroke. Unable to keep up his roughly 40-year sci-fi collection due to his health, he donated everything (almost 900 boxes of comic books, records, tapes, anime, manga, programs from science-fiction conventions dating back to the 1930s, convention T-shirts, paperbacks, and an array of sci-fi fanzines back to the 1930s) to the J. Lloyd Eaton Collection at the University of California at Riverside, which houses the world's largest collection of science fiction, fantasy and horror. Fan Guest of Honor: DeepSouthCon 9 (New Orleans, 1971); Conquistador 1984 (San Diego); Anime America 1993 (San Jose); Anime Fest 1994 (Dallas); FanimeCon 2000 & 2001 (Santa Clara CA); Anime Overdose 2004 (Santa Clara CA); Anime Weekend Atlanta 10 (2004); Animé Los Angeles (2005). Convention Chair: Westercon 27 (1974); Loscon 14 (1987). Awards: Evans-Freehafer Award (LASFS), 1965; Sampo Award, 1971; Inkpot Award (San Diego Comic-Con), 1980; Ursa Major Award 2003 (for book "Best in Show"). Fandom Clubs: LASFS (1960- ), past Director; Cartoon/Fantasy Organization (Founding Member, Secretary, 1977- ); SCIFI Board of Directors (Founding Member, 1982-1988). APAs: APA L (Contributor to all distributions, #1 to date, 1964- ; past Official Collator); CAPA-ALPHA (member and past Official Editor, 1964-70); ROWRBRAZZLE (1984- ; Official Editor 1989-2005); past member of FAPA, SAPS, OMPA, The Cult and others. Other Fanac: Founding Member of Furry/Anthropomorphics Fandom; Founding Member of Anime Fandom; U.S.A. Agent of Aussiecon, Aussiecon II, and Seacon `79; Co-Founder of Down Under Fan Fund (DUFF). He currently lives at a convalescent hospital in North Hollywood, California. I am omitting the Credits section because Ashworth did not condense it to the highlights of my personal biblio-graphy, as I had expected; he posted the entire list of every article I have written. I should probably edit this down myself. Wikipedia entries are supposed to be encyclopedic, not complete to the smallest detail. Wikipedia has articles on Furry, Anime, and Manga. As explained in the biography of the article, this man has had a long history with all of them and has had a hand in documenting them (and actually published in hardcopy, not just on the Internet). His "relevance" is his heavy connection with these other topics. The items stated in this article are relevant to his role in these interests which have already been thoroughly documented in this website, and they are researched and factual. If someone would want to take the time to explain how this article is not in keeping with the "voice" of Wikipedia I would be interested to read it. I notice others have already started to make coding changes to bring it in line. Vanamonde #664 - (Hertz) Do those who consider none of the candidates for a "best" award very good usually bother to vote at all? That is what "No Award" is for. De Jueves #1465 - (Moffatt) Yes, it is Vanessa Van Wagner's decision to fill any blank space in ¡RR! with Allison Hershey's Inherit the Earth comic strip. I see that, unlike the other Internet comic strips that she has used as filler in the past, which have been the most recent episodes of those strips, she is printing Inherit the Earth in full from the beginning. It only began last March and there are just 43 weekly strips to date, which leaves 32 between the latest printed here and the most recent online, so Inherit the Earth will probably appear here for quite a while. I did not mention in my Animé Los Angeles 2 report that there was an Inherit the Earth table in the Dealers Room that was selling the role-playing game, the t-shirts, the coffee mug, the music CD, and probably other items. (They are also orderable from the comic strip's website, for those who do not want to wait for the next con where they are on sale.) I am waiting until there are enough comic strips to publish a collection of them in book form, which, considering how thoroughly Wyrmkeep Entertainment is merchandising the Inherit the Earth concept, seems inevitable; though with only 43 strips published so far, it will probably take a couple of years for enough for a book to accumulate.. ## I have been told that I snore loudly, but I have never noticed any trouble in breathing while I sleep. ## And now Albertsons is disappearing, as a result of the chain having been bought out by SuperValu, according to January news reports. No date was given as to when the supermarket signs will be changed from Albertsons to SuperValu. It does not seem that long ago that my local Albertsons (well, the supermarket two blocks from my apartment in Culver City where I did most of my grocery shopping for forty years) was a Lucky's. Lots of Apologies, This Time - (Cantor) My wheelchair right brake extender is supposed to extend at a right angle (a left angle?) across enough of my body that I can lock and unlock the right brake with my left hand. I do not know if it needs to extend all the way across my body so it is right next to the left brake lever. I had thought that this was a relatively standard piece of equipment since a lot of wheelchair-bound patients are paralyzed on one side or the other and cannot use one hand; but from the way the wheelchair company is making it sound like nobody has ever needed such a thing before, I wonder if wheelchair users who can only use one hand are expected to use only one of their two brakes. Godzillla Verses #74 - (DeChancie) The last that I recall hearing or seeing about Forry Ackerman's lawsuit was to the effect that he had won, but the other party was refusing to pay the judgment and that Forry was going (or expected to go?) back to court to ask for the loser to be forced to pay. If there was a followup to this, I missed it. MS Found in A(nother) Klein Bottle #33 - (Shapero) Many thanks in advance for buying me a copy of The Spriggan Mirror. I have enjoyed Watt-Evans' Ethshar novels enough that I will probably want to keep it for at least a while before givin it to the Eaton Collection. ## I barely remember the View Park branch of the library on 54th Street (a branch of the L.A. County, not city, Library). I never went to 54th Street Elementary School. My school bus took me to Angeles Mesa Elementary School on 52nd Street, and the Angeles Mesa branch of the L.A. Public Library was right across the street from it. That was also the only library that my parents went to/took me to. The View Park Library was much smaller than the Angeles Mesa Library, and farther from my home, so I was not able to get to it until my teens when I was allowed to walk farther from home without parental supervision. It had only a few s-f books that I had not already read by then at the Angeles Mesa Library or the Audubon Junior High School library, so I only went to the View Park Library a few times. ## The Woolworths general store that I "grew up in" matches your description of its contents, but it was on Crenshaw Boulevard between 54th and 57th Streets. It was a big old barnlike building with a creaky wooden floor. Crenshaw Shopping Center had not even been built yet - in fact, I am not sure the concept of shopping centers had been developed yet, in the late 1940s and early '50s when I would go to Woolworths to look for comic books &/or toys. ## Is it my imagination, or is Apa L getting more nostalgia-filled these days? Vanamonde #665 - (Hertz) My impression of Karahashi Takayuki from Animé L.A. 2 was that he could be a fine panelist in his own right, not just a translator for others. Do you know whether he lives in America, or did he come from Japan with Inoue-san? Fish Out of Water #157 - (Helgesen) Have any decorated evergreens in December been anything other than Christmas symbols (or generic "holiday symbols" this last year, I suppose) for the past several centuries? This reminds me of the first time that I saw mistletoe in its natural state, during one of Bĵo Trimble's camping trps into the desert during the 1960s. The mistletoe had killed the tree in which it was a parasite and was perched in the skeletal branches of the dead tree like a bloated octopus. Very creepy. I Ergonomically Undulate - (Gold) It sounds like future TV series will be much more stfnal than TV used to be, when s-f programs were both rare and clearly labeled. I assume that future-war and political-conspiracy plots will be considered mainstream and not s-f by the TV programming executives today. ## Hooray for the Narnian movies being produced in the order the books were originally published! I will look forward to Prince Caspian late next year. ## I wish that the professional subtitlers of the anime AirMaster series had looked up "luchadore" as you did, instead of spelling it "roochadore". (AirMaster battles the masked luchadores who wander the streets of Tokyo. It is not an awfully serious TV series, although more serious than the same anime studio's Bobobo-bo Bo-bobo about the superhero with the prehensile nose hairs, master of the school of Nose Hair Karate.) ## On "technically, there were no sciences at the time of The Iliad", I just finished reading (from the L.A. Public Library) The Pig Scrolls, by Paul Shipton, a Monty-Pythonesque take on the Trojan War period as narrated by one of Odysseus' shipmates who does not get turned back from a pig by Circe along with the other sailors. 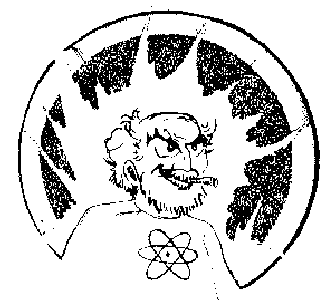 An important character is the philosopher Thales, who is portrayed as history's first Mad Scientist, inventor of the atomic-powered toaster, leaky ballpoint pens, etc. I recommend the novel to those who like lines like, "The rest of the day went by so slowly, I couldn't help wondering if Apollo hadn't parked the Chariot of the Sun and slunk off for a bag of chips." ## Thanks for the photographs of the armonica/glass harmonica. It certainly does not look like a traditional harmonica. Luny Tunes #11 - (Castora) On oil still being produced deep in the earth, I am never forget (who said that?) the Irwin Allen disaster movie, or the LASFS' reaction to it (When Time Ran Out, 1980), that starred Paul Newman as an oil-well drilling foreman for a major oil company that was prospecting for a new oil field in the flanks of an active volcano. Were you around the LASFS at the time? ## I just checked the Los Angeles Public Library catalogue online. The library may not have carried the Uncle Wiggily books when I was a boy, but it has a 1988 edition of Uncle Wiggily to the Rescue (32 pages) today. I have reserved it, and I wll review it here after Kay Shapero picks it up for me.